Language learning app Babbel says its recently launched magazine is the No. 1 source of leads, or prospective customers, to the Babbel program. Babbel claims to be the top-grossing language app, with over 1 million active paying subscribers. The magazine inspires readers to learn a language and sign up to pay to use the program, Babbel’s U.S. CEO Julie Hansen told Publishers Daily. Babbel magazine wants to connect with language-learners through editorial content on interesting topics, like food and culture, and practical ways to better learn a language. Some of the most popular articles address how to say simple phrases, such as: “Hello,” “Where is the bathroom?” and “I love you” in 10 different languages. The idea is the content will draw visitors to the site and inspire them to pay to learn a new language through the Babbel app, which costs from $6.95 to $12.95 a month. An article on a trip to Spain, for example, may link readers to Babbel lessons on Spanish phrases to use at a hotel. Or it could simply display a link for readers to try out Babbel. “We want the magazine to guide users through and to content,” Hansen said. She was previously COO, Business Insider and held executive roles at Condé Nast and Time Inc.
Babbel publishes about 10 stories a week for the magazine. The digital magazine has a team of five writers, two video producers and a social media editor behind it. The Babbel magazine has over 1,000 articles in English. It also publishes content in seven other languages. Babbel teaches 14 languages in total: English, Spanish, German, Italian, French, Portuguese, Swedish, Turkish, Dutch, Polish, Indonesian, Norwegian, Danish and Russian. The Babbel program focuses on immersion in a new language through real-life situational dialogue, using speaking, listening reading and writing lessons. Babbel also publishes word books to help users practice on paper. The program uses “language pairs” to facilitate learning a language. If an English speaker is learning German, for example, it will use the similarities between the languages to help the user get a grasp on the language they are learning. “It is all about building on what you already know” from your native language, Hansen said. 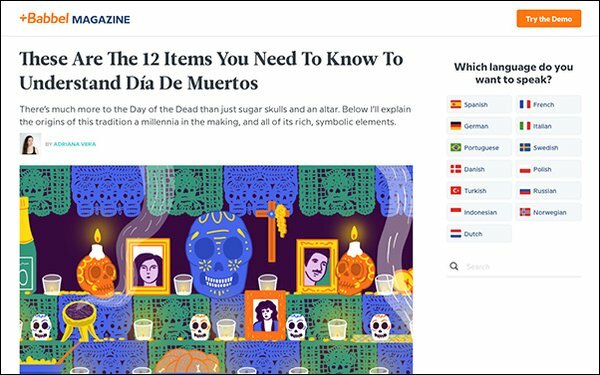 Babbel content gets syndicated on Business Insider, Mic and the Matador Network. Most of Babbel's content is aimed at an American audience, and the majority of its readership comes from the U.S. Two-thirds of the magazine’s visitors are millennials. Babbel was founded in 2007 in Germany by CEO Markus Witte. It came to the U.S. in 2015. A key goal behind the magazine is to market the brand more broadly in the U.S.
Babbel plans to soon introduce crosswords (“The German word for…?”) and a podcast, Hansen said. It is available on mobile and desktop.